The RMS Lusitania was sunk by a German U-boat 12 miles off the coast of Kinsale, leading to international condemnation of Germany’s submarine warfare tactics. 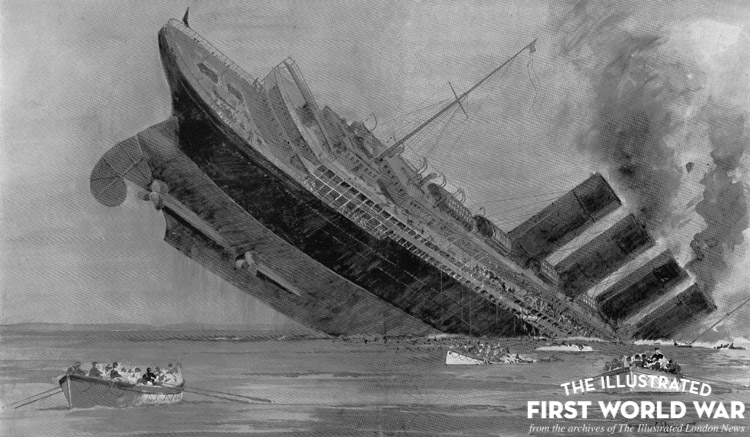 The Illustrated London News reported that on the morning of the Lusitania’s departure the German embassy in Washington D.C disseminated a Berlin Government notification – a submarine attack on the great liner was planned. The same article noted that “Not conceiving that any civilised nation could really contemplate so unspeakable a crime, the notice was treated by the passenger as an incredible and mere bluff.” However, the ship was identified and torpedoed by the U-20 German U-boat on the 7 May 1915 killing 1,198 people on board. British Prime Minister Herbert Asquith asserted that the Great War was now being fought with a “progressive disregard” of the previously accepted rules of warfare. The sinking of the Lusitania was a consequence of Germany’s naval blockade of British ports. Germany followed a policy of “unrestricted submarine warfare” whereby all merchant vessels, enemy or neutral, believed to be supplying Great Britain would be sunk on sight. As an island nation, Britain relied heavily on foreign imports to support her population and it was Germany’s hope that inhibiting this supply would force Britain to surrender. However, fears that diplomatic ties with neutral nations would suffer meant that Germany did not employ unrestricted submarine warfare throughout the entire war. However, Germany’s resistance to blockade was far less effective than Britain’s. They simply couldn’t match Britain’s naval power, and eventually starvation became a major problem on the German home front. A striking critique of this can be found in The Bystander – an image of a fat German aristocrat walking through the town streets as a bedraggled and hungry crowd of people scowl at him. The sinking of the Lusitania was a major event in the First World War. It was portrayed as deliberate murder by the British press and turned American public opinion firmly against Germany’s policy of unrestricted submarine warfare. Consequently, Germany’s reintroduction of this u-boat policy was the final straw that brought the USA into the Great War on the side of the Allies in 1917. Germany's Greatest Piracy: The Torpedoing of the "Lusitania"